Melody was chosen as a finalist for her outstanding research on the physics of polymer electrolytes for lithium-ion batteries. A College of Engineering News article can be found here. Congratulations Melody! Tapered block polymer electrolytes will enable faster charging, safer, and more durable lithium-ion batteries. The Epps group’s work is highlighted in Delaware NPR, the Council of Graduate Schools GradImpact, and UDaily. A short video from UDaily is shown below. The 2018 FFW is featured in UDaily. The event provided an opportunity for senior graduate students and post-docs to interact with faculty members from 17 universities and prepare for academic careers in chemistry, chemical engineering, materials science, and polymer science. Dr. Epps was recently named a Fellow of the Royal Society of Chemistry for his significant contributions to the field of chemistry. Congratulations Dr. Epps! Recent work on lignin-based polymers has yielded high performance pressure sensitive adhesives. The articles can be found at U.S. DOE Office of Science and UDaily. Congratulations to Melody who was awarded the Fraser and Shirley Russell Teaching Fellowship in Chemical Engineering! Melody will be teaching Chemical Process Dynamics and Control in the fall. Congratulations to Seung who won the Hanwha Award for Post Doctorial Students at the AIChE 2017 Meeting! Victoria was awarded 1st Place for her poster in the MESD Undergraduate poster competition at the AIChE 2017 Meeting. More information about the competition and AIChE can be found in this UDaily article. Dr. Epps was recently named a Fellow of the American Physical Society, an honor bestowed only on the top 0.5% of APS members, for his significant contributions to the field of physics. This honor was highlighted in this UDaily article. Dr. Epps delivered the Diversity in Science Lecture at the University of Massachusetts, Amherst hosted by the Graduate Students for Diversity in Science and Engineering (GSDSE). More information about GSDSE at UMass, Amherst can be found on their website. Dr. Epps delivered the plenary lecture at the 2017 North American Thermal Analysis Society (NATAS) Conference held this year at UD. More details about this year’s conference can be found in this UDaily article. Dr. Epps was recently appointed as the new Director of the Center for Molecular & Engineering Thermodynamics (CMET) at UD. Details about CMET can be found on the CMET website. Shelby Babcock (University of Arizona) and Grace Kresge (Princeton) joined the Epps group for the summer through the NSF REU program. More information about this summer’s REU program can be found in this UDaily article. Achievements by the Epps Group in the field of block polymers for next-generation materials are highlighted in a recent Macromolecular Chemistry and Physics talent article. More information can be found in this UDaily article. Chad is named as an ACS/ESBES International Graduate Student Design Challenge Finalist, and will present at the World Congress of Chemical Engineering! More information can be found at the WCCE website. Kaleigh was named the 2017 recipient of the Richard Wool Award for Women in Green Engineering by the University of Delaware College of Engineering, congratulations to her! Cameron’s poster, “Quantifying lithium salt distributions in nanostructured ion-conducting polymer domains: a neutron reflectivity study”, won 1st place in the APS DPOLY poster competition at the 2017 APS March Meeting! Congrats to Cameron! The Thiele Lectureship was established in 1986 to honor Dr. Thiele’s association with Notre Dame’s Department of Chemical and Biomolecular Engineering. The Lectureship is intended to recognize outstanding research contributions by a younger member of the chemical engineering profession. Previous lecturers in the series, and more information can be found at the Notre Dame Department of Chemical and Biomolecular Engineering Website. The University of Delaware hosted the “Future Faculty Workshop: Grooming Diverse Leaders for the Future”, which was organized by Dr. Epps. Senior graduate students and postdocs joined with eminent faculty in soft materials to learn about the faculty application and interview processes, proposal writing, networking, research directions and research group management, and publication and presentation skills. An article about the workshop can be found at the UDaily website. The two-day workshop will provide mentorship to senior graduate students and postdoctoral fellows aspiring to become independent academic researchers in the broad areas of Chemistry, Chemical Engineering, Materials Science, and Polymer Science, with a focus on soft materials and biomaterials. Eminent professors will cover topics such as the faculty application process, interviewing, proposal writing, networking, choosing research directions, research management, and publication/presentation skills. More information can be found at this page. The Epps group was recently awarded a grant in collaboration with DuPont Performance Materials to study the directed self assembly of oriented block polymer nanostructures for patterning applications. More information can be found at the UDaily website. Dr. Epps was recently promoted to professor in the Department of Chemical & Biomolecular Engineering; details can be found on the UDaily website. Chad was awarded this honor by the University of Delaware College of Engineering, which honors his excellence in research and mentorship. This award is granted to the top TAs in Chemical and Biomolecular Engineering at UD. Awardees are nominated by class instructors, assessed by student evaluations and voted on by the department’s faculty. Victoria was awarded a 2016 Barry Goldwater Scholarship. Undergraduate Juniors and Seniors are eligible for the award, which aims to provide a continuing source of highly qualified individuals to the fields of science, mathematics, and engineering. More information can be found at the Goldwater Scholarship website and in the UDaily. Victoria was awarded 2nd place for her presentation at the ACS Division of Polymer Chemistry Undergraduate Research in Polymer Science Symposium at the ACS Spring 2016 Meeting. More information can be found at the ACS POLY website. Dr. Epps was awarded this honor by the Divison of Polymer Physics of the American Physical Society. He was also featured on the UDaily, highlighting this award. More information on the award can be found on the UDaily website. Dr. Epps was awarded this honor by the Materials Engineering & Sciences Division of the American Institute of Chemical Engineers. He was also featured on the UDaily, highlighting this award. More information on the award can be found on the AIChE Website and the UDaily website. Angela is selected to speak at the AIChE 08A Excellence in Graduate Polymer Research Award Symposium. The special session is scheduled for the 2015 AIChE National Meeting in Salt Lake City, Utah where the ten invited speakers will compete for recognition at the Area 8A Polymers business meeting. Her presentation is entitled “Multicomponent Mixtures as a Means for Tuning Properties and Reducing Costs of Biobased Plastics. Angela is awarded a UD Dissertation Fellowship. The University Dissertation Fellows award supports Ph.D. students in their final year of study and enables them to devote full attention to the completion of their doctoral dissertation. The Epps’ group battery membrane research was featured in the UDaily. The focus article can be found on the UDaily website. Congratulations to Angela for being selected to speak at the 2015 Polymers Gordon Research Seminar! She is one of eight student speakers chosen from a competitive pool of graduate and postdoctoral students. Her presentation is entitled “RAFT Polymerization of Complex Mixtures in Pursuit of Sustainable Polymers from Bio-Oils.” Further information can be found on the 2015 Polymers GRS website. Kaleigh is selected to attend the 65th Lindau Nobel Laureate Meeting. She was selected as one of the top 650 applicants. The meetings have initiated intergenerational scientific discussions since 1951. More information on the meeting can be found on the Lindau Nobel website. Chad’s work on light-sensitive polymers for controlled gene silencing is featured on materialsviews.com. This work, which is a collaboration between the Epps and Sullivan groups, details a light-sensitive copolymer system which controllably binds and releases siRNA for gene silencing in tissue engineering applications. More information can be found at the Materials Views website. Ming and Cameron’s work on XPS depth profiling highlighted at Nanotechweb.org. More information on this collaboration with MIT can be found at the Nanotechweb website. Rashida is awarded a NSF Systems Biology of Cells in Engineered Environments IGERT Fellowship! The award runs from 2015-2017. More information can be found at the UDel IGERT website. Angela et al.’s review article is highlighted by the Soft Matter Blog. The post features their publication, “Biobased building blocks for the rational design of renewable block polymers,” as a HOT article for August! and leads to the article’s inclusion in the 2014 Soft Matter Hot Papers Themed Collection. Elizabeth was awarded a National Research Council’s post-doctoral fellowship at the National Institute of Standards and Technology (NIST). Elizabeth will be working for two years at NIST. She will focus on using small angle neutron scattering (SANS) and neutron spin echo spectroscopy (NSE) to investigate lipid bilayers to gain a more comprehensive understanding of factors that govern nanodomain formation in model membrane systems. More information can be found at the NIST website. Angela received the UD Professional Development Award. The University of Delaware’s graduate office sponsors a Professional Development Award to support students’ participation in professional conferences within their respective fields. More information can be found at the UD website. Elizabeth received the Council for Chemical Research (CCR) graduate student award at the May meeting in Alexandria, VA. The CCR meeting brings together senior research leaders from academic, industrial, and government sectors. This year the CCR invited 8 PhD students to give presentations. More information on the CCR can be found at the CCR website. Ellen was highlighted in the UDaily for presenting her work at the recent Delaware Space Grant Consortium. The University of Delaware is an affiliate of the DESGC. Ellen recently received a grant to support her summer work, which she presented at the April 11 symposium. More information can be found at the UDaily website. The Epps and Sullivan groups were highlighted in the UDaily for their recent work published in Nature Communications. The publication discusses the changes in block copolymer micelle sizes after commonly employed processing techniques. The publication gives insight to the dynamics involved in micelle size evolution, which is usually assumed to be static. The news article can be found on the UDaily website. Congratulations to Dr. Epps for receiving the 2014 Sigma Xi Young Investigator Award! Dr. Epps was nominated for the award by his peers, Dr. Pochan (Materials Science & Engineering, UD) and Dr. Lenhoff (Chemical Engineering, UD), for his positive impact on the polymer physics community. More information on the award can be found on the Sigma Xi website. Kaleigh presents her work with BPA alternatives on ACSLive. Dr. Epps joins the advisory board of Polymer Chemistry. Polymer Chemistry is published by the Royal Society of Chemistry, and features articles covering polymer synthesis, structure and function, characterization, composites, and applications. Dr. Epps is the newest of 43 members of the advisory board. More information on the journal can be found on the RSC website and blog. Congratulations to Angela for receiving the 2013 Ciba Travel Award in Green Chemistry. The award is open to applicants interested in attending an American Chemical Society technical conference. Angela will use her travel award to attend the ACS National Meeting in San Francisco in August 2014. Angela’s award was also noted on the Women in Nanoscience blog. More information on the award and program can be found on the ACS website. Dr. Epps is featured in a UDaily news article for an invitation to the NAE Frontiers in Engineering EU-US Conference. Dr. Epps is one of 30 US scientists to present his research to the international audience. The conference will be held in Chantilly, FR from November 21-23. The article in the UDaily can be found on the UDaily website. Dr. Albert begins at Tulane University’s Chemical Engineering Department. Dr. Albert, an alumna from the Epps Research Group, starts her career as an assistant professor. Tulane welcomed her with an article on the University’s website. Kaleigh wins ACS Green Chemistry Conference student poster award. More information on the ACS Green Chemistry & Engineering Conference can be found at the conference website. Dr. Epps is selected to attend the NAE Frontiers of Engineering EU-US Conference in Chantilly, France. The conference brings together 60 top young engineers to discuss hot topics including nanosensors, big data, future of transportation, and wireless broadband technology. More information on the conference can be found at the conference website. Angie and Kaleigh receive the 2013 NSF Scholar award to support their attendance at the 17th Annual Green Chemistry & Engineering Conference. The two are amongst thirty six students to receive the award. Angie’s presentation will be entitled “Lignin- and fatty acid-derived block copolymers for nanostructured thermoplastic elastomers.” Kaleigh’s presentation is entitled “Getting a handle on vanillin: Green Modifications.” More information on the conference can be found at the conference website. Julie, a former Epps group student, has accepted a faculty position with Tulane University. Julie was one of the first students to graduate from the Epps group and subsequently held a post-doctoral position at North Carolina State University with Dr. Genzer. Julie will begin at Tulane University in January 2014. More information on the University can be found on Tulane’s website. Elizabeth is selected to attend the 63rd Lindau Nobel Laureate Meeting. She was selected as one of the top 550 applicants. The UDaily has published a story featuring Elizabeth and can be found on the UDaily website. The meeting have initiated intergenerational scientific discussions since 1951. More information on the meeting can be found on the Lindau Nobel website. Wei-Fan was recently covered in the UDaily for his work on lithium batteries using polymer membranes. MIT news covered Dr. Epps’ position as a Martin Luther King visiting professor. The article can be read on the MIT news website. Congratulations to Wei-Fan for receiving the ACS POLY graduate student travel award! Wei-Fan will attend the Spring ACS 2013 meeting in New Orleans. Information on the spring meeting can be found at the ACS website and information on the student award can be found on the POLY website. Dr. Epps was featured in the MIT Department of Chemistry newsletter, highlighting his Martin Luther King, Jr. Visiting Professorship. Dr. Epps began his visiting professorship while on sabbatical. The professorship was founded to highlight outstanding contributions from minority scholars. More information on the professorship can be found at the MIT website and the Department of Chemistry newsletter. Sarah’s poster wins the runner-up award at the Warwick 2012 Polymersconference! The conference, Warwick 2012 Polymers: MacroGroup UK International Conference on Polymer Synthesis & UKPCF International Conference on Polymer Colloids, was hosted at the University of Warwick in July 2012. Sarah’s poster was entitled “Synthesis and self-assembly of poly(methyl methacrylate-b-m-triphenylamine) block copolymers”, and co-authored with Joseph P. Patterson, Rachel K. O’Reilly, and Thomas H. Epps, III. Robby Pagels was named the outstanding man of his graduating class! Robby received the Alexander J. Taylor Sr. award for exemplifying exceptional leadership, academic success, and community service. More information on Robby’s award can be found at the UDaily website. Wei-Fan Kuan’s publication is highlighted by ACS. The article, entitled “Triblock copolymers with tapered interfaces form nanonetworks” was published in ACS Macro Letters and distinguished with Noteworthy Chemistry. Information on the article can be found at the ACS website. with particular attention towards a recent Soft Matter publication entitled “A Simple Approach to Characterizing Block Copolymer Assemblies: Graphene Oxide Supports for High Contrast Multi-Technique Imaging”. The article can be found the UDaily website. Dr. Epps receives Martin Luther King, Jr. Visiting Professorship at MIT for 2012-2013 academic year. The program honors the life and legacy of Dr. Martin Luther King, Jr. by increasing the presence of scholars at MIT. Information on the Professorship program can be found on the MIT website. 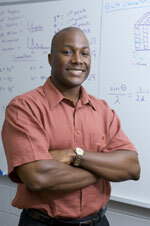 Dr. Epps is an invited speaker at the 2012 Polymer Physics Gordon Research Conference. The presentation is entitled “Interfacial manipulations: controlling ordering in bulk and thin film block copolymers.” Further information can be found here: 2012 Polymer Physics GRC. Dr. Epps is invited to present poster at the High Polymer Research Group 52nd Meeting in Pott Shrigley, Cheshire, UK. Information on the organization can be found at the High Polymer Research Group Meeting website. Dr. Epps is an invited speaker at the 2012 Colloidal, Macromolecular & Polyelectrolyte Solutions Gordon Research Conference. The presentation is entitled “Block Copolymer Assemblies for Ion-Conduction Applications.” Further information can be found here: 2012 Colloidal, Macromolecular, and Polyelectrolyte Solutions GRC. Dr. Epps is named to the Editorial Advisory Board for ACS Macro Letters. The scope of the journal includes high-impact research of broad interest in all areas of polymer science and engineering, including cross-disciplinary research that interfaces with polymer science. More information about the journal can be found at the ACS Macro Letters website. Dr. Epps is an invited speaker at the 2011 Pacific Polymer Conference in Jeju, South Korea. The presentation was entitled “Controlling Block Copolymer Interactions Using Tapering to Stabilize Networks.” Further information can be found here: 12th Pacific Polymer Conference. at the Spring 2012 American Chemical Society meeting in San Diego, CA. She received a $150 award to travel to the conference. Information on the award and symposium can be found at the UDaily website. Elizabeth is selected to present in the Excellence in Graduate Student Research Symposium at the ACS 2012 Spring meeting. The symposium recognizes outstanding research done by graduate students in the field of polymer science and engineering. Elizabeth’s presentation is entitled “Synthesis and self-assembly of bio-responsive amphiphilic block copolymers”. Information on the symposium can be found at the POLY website. Dr. Epps is awarded the 2011 Gerard J. Mangone Young Scholars award. The award is given by the Francis Alison Society at the University of Delaware. It is the highest competitive award at the University. Information on UD faculty excellence awards be found at the UDaily website. Elizabeth receives the graduate student poster award at the Polymers Gordon Research Conference. Information on the conference can be found at the Gordon Reearch Conferences website. Information on Elizabeth’s award can be found at the UDaily website.